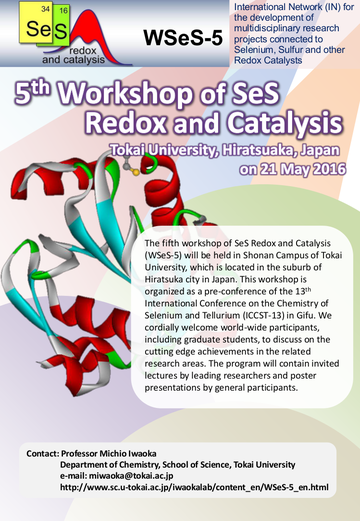 The fifth workshop of SeS Redox and Catalysis (WSeS-5) will be held in Shonan Campus of Tokai University, which is located in the suburb of Hiratsuka city in Japan. This workshop is organized as a pre-conference of the 13th International Conference on the Chemistry of Selenium and Tellurium (ICCST-13) in Gifu. We cordially welcome world-wide participants, including graduate students, to discuss on the cutting edge achievements in the related research areas. The program will contain invited lectures by leading researchers and poster presentations by general participants.